A lot of photographic situations call for long exposures or the need for a steadying influence. This is why a tripod is such a useful tool for photographers. However, it's not just a case of knowing when to use a tripod. You need to know how to use a tripod properly to make sure it provides adequate support to your DSLR. First, you need to make sure your tripod can adequately support the weight of your DSLR. It's no good buying a cheap, flimsy tripod for $5 and then expecting it to support a DSLR with lenses! 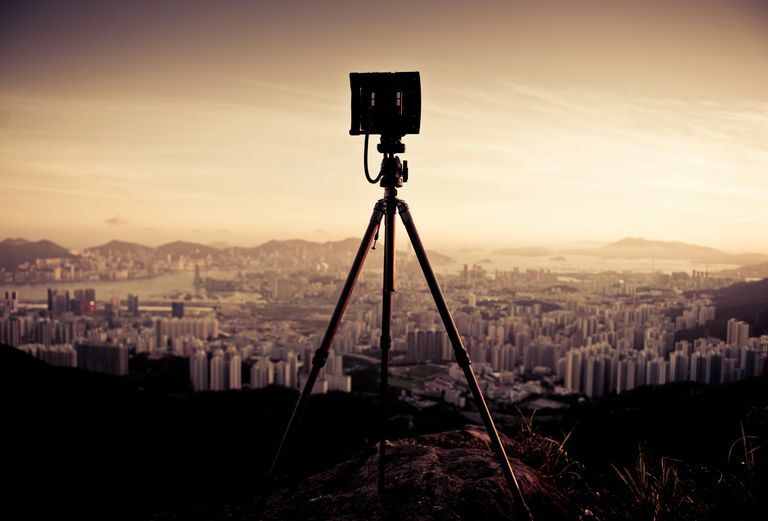 Invest in as sturdy and hardy of a tripod as you can afford. Try to find level ground to put your tripod on, so that it's not rocking back and forth, placing it in danger of tumbling. Spread all three legs out to their full width to ensure level support. If you need to extend your tripod, start from the top with the widest leg extensions. Lock each leg into place once you have extended it. If you've extended your tripod to its full height, and you still need more extension, you can raise the center column. However, you need to remember that a taller center column won't be as stable as the legs, and it could cause the camera to wobble. If your tripod comes with a spirit level attached, use this to check that your tripod is level. Attach the camera to the tripod head using the screw-in tripod quick release plate. Screw this firmly into your camera's tripod thread (located on the bottom of your camera), and click it into place on the tripod head. Remember to lock this! Adjust your tripod head and tighten all screws so that the camera doesn't slip or move during shooting. If it's a particularly windy day, you can attach a heavy bag to the bottom of your tripod's center column to help keep it stable. The most obvious use for a tripod is when you want to shoot long exposures without camera shake. For slower than 1/60 shutter speeds, you'll need a tripod to achieve pin-sharp images. If you want to create an ethereal, misty look to running water, you'll also need to use a tripod and a long exposure. An easy way to make sure your landscapes have a level horizon line is to use a tripod. Once you've leveled the tripod and set it up correctly, you won't need to worry about your camera tilting as you compose an image. If you're shooting still life, a tripod makes it easier to keep every different object at the same point in the frame, and it helps with stability when focusing on small objects. Tripods are useful for shooting a succession of identical portraits, allowing the photographer to merely place different people on the same mark and cutting down on the time it takes to compose each shot. This can be particularly vital in fast-paced corporate photography. Tripods can help prevent back injuries! If your DSLR is heavy, and if you constantly carry it around your neck while you're shooting, your back will suffer. Putting the camera on a tripod will help to avoid this problem. A monopod is a single column with a tripod screw on top. A spike at the bottom of some heavy-duty monopods digs into the ground. Others are handheld. They are often used in conjunction with a tripod to support heavy telephoto lenses. A fixed 400mm, for example, is a struggle for a photographer to support with one hand. These longer lenses tend to be supplied with a tripod ring which fits around the lens. These have a tripod screw on them, which can be attached to a monopod. A monopod is an extremely useful tool if you have a big heavy lens.